Idaho .Who Needs a Commercial Drivers License? Idaho maintains similar standards to those of other states regarding commercial driving requirements. Class A vehicles are defined as combination vehicles with a gross weight of 26,001 pounds or more, providing the trailer weighs 10,000 pounds or more. Most vehicles meeting this description are tractor-trailer trucks. In order to obtain a class A CDL, the driver in question must be eligible for or already hold a class D Idaho state license. Drivers may take the class D test and if they pass, immediately take the CDL test, but they must have at least a year of driving experience and be at least 18 years old. In order to drive interstate routes, a driver must be 21. Drivers should study the Idaho Commercial Driver’s License Manual and ascertain whether they need a federal Department of Transportation Medical Card. Obtaining this card requires passing a physical examination and must be done before a CDL can be issued. Disqualifying conditions include severe hearing loss, insulin-controlled diabetes, uncontrolled high blood pressure and more. Once these steps are complete, the driver can pay his or her fees and take all of the appropriate written tests. He or she must also present a social security card at the time of examination. After passing the written exams, a driver is eligible for a CDL learner’s permit. Like a learner’s permit for non-commercial vehicles, it is only valid with a licensed (class A CDL) driver in the passenger seat. In order to obtain a full license, drivers must pass a skills test conducted in the class of vehicle they wish to drive. The skills test is not scheduled until the driver passes the written exams. It consists of three parts including a vehicle inspection, a basic control test and a road test. Restrictions are placed on the license based on the type of vehicle used to take the skills test. Endorsements and restrictions outline which types of vehicles the licensee may drive. Restrictions are based on the vehicle used to take the skills test while endorsements are added by taking and passing a written exam. Endorsements offer the ability to drive tanker, passenger or multi-trailer vehicles as well as transport hazardous materials with a hazmat placard. They may be added at a later date or taken with the basic written test. 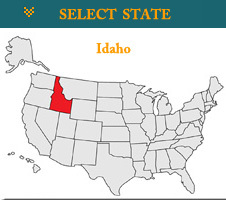 To prepare for the written test, study the Idaho CDL Manual.